After several weeks of relative calm in the Somali capital of Mogadishu, expelled Islamist leaders now based in Eritrea have pledged to continue attacks despite setbacks suffered in battles with Ethiopian troops in March and April. Two-thirds of the original Ethiopian force has now been withdrawn, and a three-week old cease-fire between Ethiopian troops and Mogadishu’s dominant Hawiye clan appears to be holding. Some 1,500 Ugandan soldiers of the African Union’s peacekeeping force are patrolling Mogadishu, but the rest of the projected 8,000-man force has yet to materialize, despite pledges from Nigeria, Burundi, Ghana and Malawi. The Ethiopian Foreign Ministry claims that 800-900 insurgents were killed in March and April, although this figure appears to include some of the 1,400 civilians killed in the fighting. Ethiopia also disputes the number of refugees, claiming the existence of only 80,000 displaced persons as opposed to UN estimates of 400,000 (SomaliNet, May 19). The UN’s relief chief for Somalia has described the refugee crisis as “worse than Darfur” (Shabelle Media Network, May 15). Indiscriminate retaliatory shelling from Ethiopian troops, following attacks on their bases, devastated many Hawiye neighborhoods and cost the insurgency in terms of local support. After assessing their losses, the insurgents appear to have abandoned their preferred methods of hit-and-run mortar attacks and open gun-battles in favor of a shift to Improvised Explosive Devices (IEDs) and targeted assassinations. For example, a remote-controlled roadside bomb hidden in a pile of trash killed four Ugandan soldiers and injured five more on May 16. Four days later, a large roadside explosive device hidden in a plastic bag killed two civilians, while another bomb narrowly missed a Transitional Federal Government (TFG) convoy, killing two civilians instead. 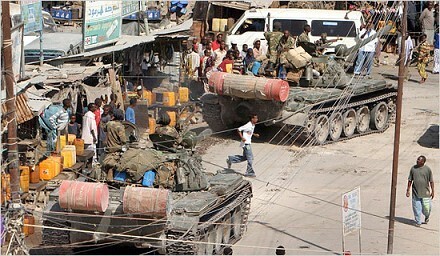 The main road through the Bakara market was closed the same day when another bomb was discovered close to a TFG base. TFG Prime Minister Ali Muhammad Gedi was nearly killed on May 17 by a grenade thrown by a would-be assassin. Former warlord and new Mogadishu mayor Muhammad Dheere was targeted on May 20 by grenades thrown from an assassin in a tree. Dheere survived, noting: “It seems the Islamic insurgents are still active in Mogadishu, but we will get rid of them” (Shabelle Media Network, May 20). The TFG has responded with controversial new tactics of its own, including seizing and burning women’s veils to prevent insurgents from disguising themselves in women’s garments (al-Jazeera, May 9). Ugandan President Yoweri Museveni has urged AU members to pursue a more vigorous form of “peacemaking” that is closer to conflict intervention than the traditional definition of “peacekeeping.” “If we follow the UN concept of waiting for peace to return before we deploy peacekeepers, then we are bound to lose many lives,” he explained. “We should deploy even when fighting is still going on” (Shabelle Media Network, May 16). Ugandan troops are struggling alone in Mogadishu, waiting for the arrival of the rest of the AU peacekeeping force. The deadly attack on a Ugandan convoy suggests that the insurgents regard any foreign detachment as an occupying force. It does not help that the AU headquarters are located in Addis Ababa. The trouble is that the AU deployment was intended to replace the much-hated Ethiopian army, not work alongside it. There is little alternative, however, as an immediate Ethiopian withdrawal would place an isolated Ugandan force in a precarious position, with little choice but to drive an evacuation column overland back to Uganda or to evacuate by sea from their base on Mogadishu’s waterfront. The AU’s and Addis Ababa’s U.S. patrons have warned the Ethiopian government against making a hasty withdrawal. Ethiopian Prime Minister Meles Zenawi complains of the “onerous” financial burden imposed on Ethiopia by keeping its troops there. According to Zenawi, the resistance has been broken and conditions have been established for peacekeepers “to do their job” (Shabelle Media Network, May 15). Zenawi has promised that Ethiopian troops will leave as soon as AU forces arrive in support of the Ugandans. Mogadishu’s powerful business associations have begun to transfer small arms to TFG depots, but lacking confidence in the permanence of the new government, they have failed to turn over their heavy weapons or “technicals” (armored pick-up trucks equipped with anti-aircraft weapons) (Banadir, May 4). After several large-scale robberies by men wearing TFG uniforms, the businessmen are now demanding that Ugandans rather than TFG men provide security for the commercial district (Shabelle Media Network, May 17). On May 17, the United States appointed career diplomat John Yates as special envoy to Somalia. Yates wasted no time in claiming that the roadside bombing that killed four Ugandans was evidence of al-Qaeda activity in Mogadishu (Reuters, May 18). A spokesman for the AU also alleged al-Qaeda responsibility for the attack (Shabelle Media Network, May 18). In Uganda, public opinion is quickly turning against the Somali mission as reports of casualties come in. There are calls in the Ugandan press for the AU to admit its inability to manage the Somali mission and turn over responsibility to the UN. The chairman of the AU Commission, Alpha Konare, conceded on April 27 that, “If other countries do not commit troops soon, it will be a disaster for Africa” (New Vision [Kampala], May 7). Following the introduction of a new two-year plan to eliminate religious-based political extremism in Yemen, President Ali Abdullah Saleh made an official visit to Washington from April 30 to May 3. While in the United States, President Saleh discussed security and counter-terrorism efforts with President Bush, FBI Director Robert Mueller, Secretary of State Condoleezza Rice, Secretary of Defense Robert Gates, CIA Director Michael Hayden and members of the House of Representatives Intelligence Committee. The visit marked an enormous change in U.S.-Yemeni relations since the dangerous days following the September 11 attacks, when a U.S. attack on Yemen seemed imminent. At the conclusion of his stay, President Saleh thanked the United States for its support of Yemen’s counter-terrorism efforts, while President Bush spoke of Yemen’s continuing cooperation in bringing “radicals and murderers” to justice. Nevertheless, while the sometimes-tempestuous U.S.-Yemeni alliance carries on, there are serious differences between the Yemeni and U.S. approaches to counter-terrorism. The most unusual aspect of Yemen’s counter-terrorist efforts is a broad effort to reform religious extremism (both Shiite and Sunni) and replace it with a moderate approach to Islam. This task (rooted in traditional Yemeni methods of conflict resolution) has been handed to Yemen’s recently appointed minister for Endowments and Religious Guidance, Judge Hamoud Abdulhamid al-Hitar, who states, “The strategy will be an important factor in treating their mistaken ideas” (Yemen Observer, April 30). As the leader of Yemen’s Dialogue Committee, al-Hitar developed a policy of confronting incarcerated militants in debates designed to expose their misinterpretations of Islamic doctrine and challenge the legitimacy of al-Qaeda-style jihadism. Using “mutual respect” as a basis for the discussions, al-Hitar points to numerous successes in reforming the views of extremist prisoners, some of whom later provided the security apparatus with important intelligence. Hundreds of terrorism suspects have passed through the program. Recidivism is untracked, however, and there are reports that some of those released went to Iraq to fight U.S.-led coalition forces. The list of graduates is closely guarded, and ex-prisoners are warned not to discuss their participation in the dialogues, thus allowing a degree of deniability should graduates return to terrorism. Within Yemen, al-Hitar is widely believed to be a member of the feared Political Security Organization (PSO). When 23 terrorism convicts escaped from a PSO prison in the national capital of Sanaa last year, their tunnel emerged in al-Hitar’s mosque. The mass escape was clearly assisted by some PSO agents. The fact that the escapees included several convicted of bombing the USS Cole placed a severe strain on U.S.-Yemen relations. For two years, the Ministry of Endowments and Religious Guidance has kept a close watch on unlicensed Quranic schools suspected of promoting political violence, although none have been closed so far. A corps of “religious guides” (both men and women) has been tasked with promoting “the noble values of Islam” and to establish the principles of moderation and tolerance in areas where the government fears extremism is feeding on a lack of religious knowledge (Saba News Agency, April 25). Saleh has challenged the country’s religious scholars and preachers to “clarify the facts” of Islam for the Muslim community, especially in rebellious Sa’dah province, where preachers have a “religious, moral and national duty” to eradicate sedition. On April 24, Yemen’s cabinet took the unusual measure of ordering the closure of Yemen’s many arms shops and markets, finally acknowledging that the proliferation of weapons and their common use to resolve all types of disputes are continuing barriers to much-needed foreign investment. Heavy weapons are to be confiscated, while possession and sales of sidearms and assault rifles will be subject to licenses and registration. With some 50-60 million weapons in circulation in a country of 21 million people, the cabinet’s order represents only a first step toward changing Yemen’s ubiquitous arms culture. At the moment, there are 18 major arms markets and several hundred gun-shops in Yemen. Some shops will be allowed to reopen for the sale of personal arms under government control (IRIN, April 26). Yemen continues to be an important regional transit point for arms shipments of all types, a lucrative trade that benefits leading members of the regime. Legislation to regulate the possession of arms continues to be opposed by a number of members of parliament who, like most of their constituents, regard holding one or more weapons as a traditional right. Some of the larger tribes possess stockpiles of heavy weapons that they will be reluctant to part with, given the 22 tribal clashes recorded last year alone. The tribes also regard their weaponry as a means of protecting themselves from government malfeasance. Apart from the military, Yemen’s security is handled by three civilian agencies, at least two of which are believed to include Salafi and Baathist sympathizers at the highest levels. Most important of these is the PSO. A number of PSO officials have been dismissed in the last few years in an attempt to eliminate corruption and Islamist sympathizers from the organization as it is reshaped to take the lead in Yemen’s counter-terrorism effort. The PSO reports directly to the president and its upper ranks are composed exclusively of former army officers. The Ministry of the Interior runs the Central Security Organization (CSO), a paramilitary force of 50,000 men, equipped with light weapons and armored personnel carriers. The smaller National Security Bureau (NSB), founded in 2002, reports directly to the president as well. The NSB may be designed to be in competition with the PSO. The United States currently offers counter-terrorist training to members of Yemen’s security forces and is involved in helping build a new national Coast Guard (a project that also includes contributions from the United Kingdom and Australia). The CSO’s elite Counter-Terrorism Unit (CTU) is trained jointly by the United States and the United Kingdom. As a relatively new organization formed in 2003, the CTU is expected to apply innovative strategies to counter-terrorism work, while avoiding the corruption ingrained in more senior security groups. The Interior Ministry is also engaged in a campaign to decrease the size of both official and unofficial corps of bodyguards employed by public figures in Yemen. Some groups of bodyguards now approach the level of private militias, enforcing the will of local sheikhs and tribal leaders (Yemen Observer, April 24). Arbitrary arrests and extended detentions without charge or trial continue to be preferred methods of the security services. The PSO, CSO and many tribal sheikhs operate their own extra-judicial detention centers. Relatives of militants are routinely imprisoned to put pressure on wanted individuals to surrender. At a recent judicial symposium, it was suggested that there are as many as 4,000 innocent citizens being held in the prisons of the security services (Yemen Observer, April 28). Regular use of torture in Yemen’s prisons and other judicial abuses have been documented in the U.S. Department of State’s annual report on human rights (Yemen Times, March 14). The ongoing rebellion in Sa’dah province has the advantage, at least, of keeping the army busy while Saleh attempts to repair relations with Washington. Many in the officer corps were trained in Baathist Iraq and deeply oppose the U.S.-led intervention there. Dissatisfaction in the ranks has not yet become disloyalty, however, and Saleh has placed a number of family members in crucial command roles to ensure that it stays that way. These include his son Ahmad (a possible presidential successor and presently commander of the Republican Guard and the Special Forces), his brother Ali Saleh al-Ahmar (commander of the Air Force) and half-brother Ali Mohsin al-Ahmar (commander of the northwest region and a long-time Salafi sympathizer). Two of the president’s nephews serve as commanders of the CSO and the NSB. U.S. diplomats in Yemen have frequently been targeted by Salafi extremists, although Yemen’s security services have preempted several such operations. Typical of the “revolving door” approach to terrorism prosecutions that irks the United States is the case of two Yemenis convicted of trying to assassinate U.S. Ambassador Edmund James Hull (an important official in U.S. counter-terrorism efforts) in 2004. Only days after Saleh’s return from Washington, the two convicts had their sentences reduced from five years to three on appeal (AFP, May 7). 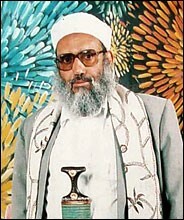 During his visit to Washington, President Saleh asked for the repatriation of Shaykh Muhammad Ali Hassan al-Moayyad, a Yemeni religious scholar extradited from Germany to the United States (along with his assistant Muhammad Za’id), where he is serving a prison term after being convicted of supporting Hamas (but acquitted of supporting al-Qaeda). Yemeni human rights organizations are agitating for the shaykh’s release on the grounds of declining health. 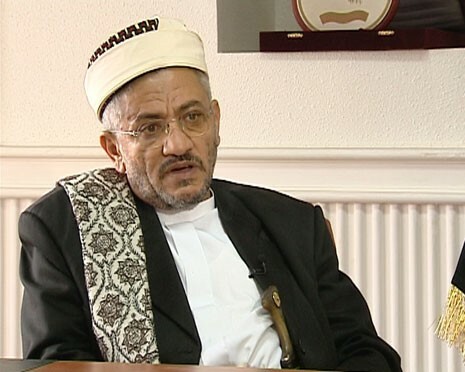 The head of a national committee to free al-Moayyad (who is popular in Yemen for his charitable work) notes that, since “Europe and the whole international community are (now) dealing with Hamas as an independent entity, why is it forbidden for al-Moayyad?” (Yemen Observer, April 25). Saleh also discussed the case of Yemeni citizens held in Guantanamo Bay. Although official Yemeni sources claim that Saleh requested the release of all the Yemeni Guantanamo Bay prisoners, there are signs that Yemen’s government is not overeager for their repatriation. In a March visit to Yemen, Marc Falkoff, a lawyer for 17 of the Yemeni detainees, revealed that he had obtained documents from the Pentagon showing that many of the Yemeni prisoners had been eligible for repatriation as far back as June 2004. The Yemeni government justifies its inaction by claiming that the citizenship of some of the Yemeni detainees is under question. According to Falkoff, “Fully one-third of the Saudis are back in Saudi Arabia, more than half of the Afghanis are home with their families and every single European national has been released from Guantanamo. Yet, more than 100 Yemenis remain at the prison—sitting in solitary confinement on steel beds, deprived of books and newspapers, slowly going insane” (Yemen Times, March 11). U.S. officials claim that there are 107 Yemeni prisoners at Guantanamo, while human rights activists cite as many as 150, but there is no doubt that Yemenis form the largest single group of foreign nationals detained at the facility. Although the government may be in no hurry for their return, reports of alleged torture practiced on Yemeni detainees in U.S.-run detention centers have inflamed anti-American sentiment in Yemen. Saleh also requested that the U.S. drop Yemen’s controversial Shaykh Abd al-Majid al-Zindani from its list of designated terrorists. Believed by U.S. intelligence services to be an important link to bin Laden and al-Qaeda, the sheikh’s terrorist designation has been an unrelenting irritant to U.S.-Yemeni relations. The sheikh is a powerful member of the Islamist Islah Party and has close ties to Saleh’s administration. Yemen’s parliament recently rescinded a decision to join the International Criminal Court (ICC) system, largely because of the fear of Islah Party MPs that the ICC could be used as a tool to extradite and try al-Zindani on terrorism charges (al-Thawri, May 2). Apparently, Shaykh al-Zindani has lately joined the call for religious scholars to correct the mistakes in Islamic interpretation that promote dissension and political violence (Yemen Observer, May 2). Security issues and concerns with government reforms led donor states to suspend economic aid to Yemen two years ago, but President Saleh’s reform efforts appear to have regained the confidence of the international donor community. Despite the detention of political activists and opposition candidates during the 2006 election campaign, Saleh’s new seven-year term as president is regarded as a sign of stability. European aid is flowing once again, and in February the Bush administration announced that Yemen was once more eligible to receive funds from the Millennium Challenge Account (MCA) (tied to progress in governance). Of the $94 million released by the MCA, $59 million is dedicated to the military and security sector (Saba News Agency, May 3). The aid represents vital assistance to Yemen’s weak economy. Unemployment persists at about 40 percent, there is little development and Yemen’s small petroleum industry does not enjoy the bountiful reserves found in its prosperous Arabian Peninsula neighbors. While Saleh cannot ignore the general discontent within Yemen regarding U.S. foreign policy, he also recognizes that cooperation with the United States is the best method of ensuring the survival of his regime. Methods such as the “dialogue with extremists” and the “revolving door” of the judicial system allow Saleh to keep a lid on Sunni radicalism, while at the same time posing as a vital ally of the United States. Despite the apparent success of Saleh’s visit to Washington, there is still much to concern the United States in its relationship with Yemen. Reforms to the security services have notably involved purges of al-Qaeda sympathizers at only the lowest levels. Yemeni extremists continue to join anti-coalition forces in Iraq and have been involved in terrorist operations in several countries as President Saleh continues his search for a “third option” in the war on terrorism.